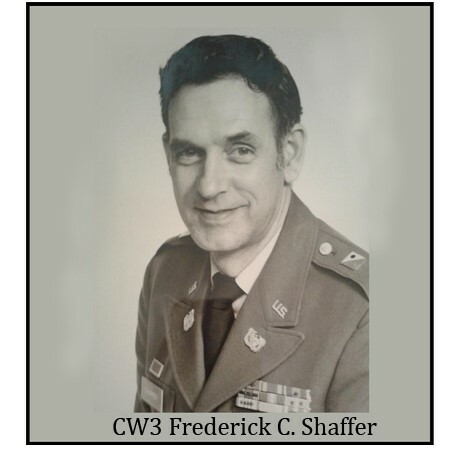 Frederick Charles Shaffer, age 86, passed away at home with family, on March 12, 2019. He was a devoted and loving husband, father, and grandfather. Fred was born on September 22, 1932 in Erie Pennsylvania to Charles Howard Chipman and Ethel Shaffer. He graduated from Girard High School in Erie, Pennsylvania. He married Joan L. Hipsley on July 30, 1955. Fred joined the Army in 1950. He served in Korea during the Korean War where he was a Prisoner of War for a short period of time. He later served two tours in Vietnam. During his Army career, Fred traveled throughout Europe and the United States. He lived in Germany, France, Massachusetts, Maryland, Alaska, Missouri, North Carolina, and Florida. He had a distinguished twenty-two-year career in the Army retiring as a Chief Warrant Officer 3. Fred followed his military career with ten years in Law Enforcement. Fred enjoyed painting. He had the opportunity to observe and study the artistry of a wide range of cultures and people. He is a self-taught, self-styled artist who integrated his experiences and his perceptions into a form of painting that has been described as contemporary, detailed, and vivid. His work has been displayed at showings in Europe, Texas, Colorado, Maryland, Pennsylvania, Alaska, and Florida. Many of his paintings have been purchased for private collections throughout the United States. Fred also enjoyed woodworking. He built most of the furniture in his home. He also built sitting benches, sheds, clubhouses, and the frames to his paintings. Fred was married for 61 years and is preceded in death by his wife Joan L. Shaffer, father Charles Howard Chipman, mother Ethel Shaffer, brother Gerald Chipman, sisters Maxine (Chipman) Olmstead, Lucille (Chipman) Klimek, and Eloise (Chipman) Tau. Fred and Joan adopted four children; Daniel Frederick Shaffer of Fayetteville, North Carolina (Karen), David Rene Shaffer of Brandon, Florida, Joseph Andrew Hipsley of Fayetteville, North Carolina and daughter Diane Yvette (Shaffer) Primm of Brandon, Florida. Fred and Joan had nine grandchildren; Alexander, Cristina, Christopher, Corey, Andrew, Alexis, and Audrianna Shaffer. Noelani and Josiah Hipsley and Steven Primm. Fred and Joan had three great grandchildren; Scottie and Lily Shaffer and Levi Primm. A Celebration of Life Service will be held in Sun City Center, Florida in June or July, 2019.